There are few business activities that don’t generate waste materials in some way. Operating a business can mean a huge daily mess of plastic wrapping, paper, cardboard and other junk that needs to be tossed out. Dumpster Rental Atlanta works with business, construction and industrial clients across the state to supply dumpsters and waste disposal services. When you’re starting to notice that the trash is piling up quickly, get in touch. We will have a dumpster out to your business as soon as possible. Dumpster Rental Atlanta Delivers to your Business or Job Site. If you own a retail store, you know that there are times of the year when trash and cardboard seem to gather into small mountains in the storage area or backyard. Generally, this happens around busy shopping times like Black Friday, Christmas and others. If you find that your store is temporarily generating far more waste, cardboard or recyclables than you can deal with – get in touch with us at Vine Disposal. We’ll deliver a dumpster that your employees can fill with everything, we'll cover you until things settle back to normal. Similar to renovating a house, doing a business or restaurant renovation generally ends up creating tons of waste material. Old shelvings, lighting, drywall, floor tiles, carpets and all sorts of other materials will quickly become a huge pile of junk outside the back door and at the parking lot if they are not put into a container. Before you begin your business renovation, contact "Vine Disposal". We’ll tell you how we can assist you, with a dumpster that will handle all your renovation waste disposal so you won’t have to deal with it. We have experience working with contractors and construction sites throughout the state. Our heavy-duty steel roll off dumpsters are capable of handling tons of construction and demolition waste, from chunks of concrete to broken sheets of drywall. When you’re ready to start constructing or demolishing that next building, contact us and we’ll show you how we can assist with your construction site’s waste disposal plan. Don’t let your project suffer delays because the site is covered in trash – let "Vine Disposal" get you the dumpsters that you need to deal with the waste and keep everything on schedule. If your charity or club is hosting a special event such as a 10K race, marathon or music festival, we can assist with creating your waste disposal plan and supplying dumpsters to gather up all of the trash and recyclables. Avoid having your volunteers and event venue be overcome with trash flying all over the place – rent a dumpster or two to contain everything, and you’re all set. Vine Disposal makes Renting a Dumpster Easy! Renting a dumpster for your business shouldn’t be difficult, and we work to ensure that the process is as easy as possible. 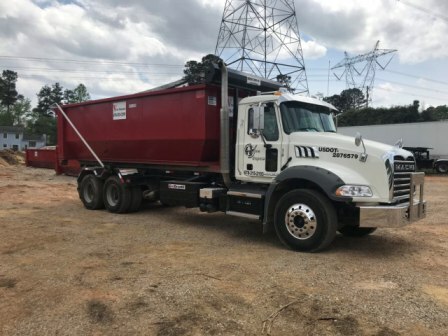 Get in touch with us toll-free at 678-315-2193 or visit the Contact Page page to leave a message, and one of our friendly team members will call you back to discuss the details of your dumpster rental and provide you with a free quote. We also supply many businesses with recurring dumpster service at rates that are very competitive with the big national waste disposal companies. If your business is constantly generating waste that you need to get be rid of – call us today!